Here's another great free song download from Charity & the JAMband. 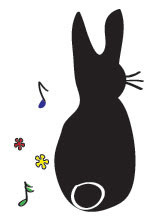 "I'm a Little Bunny" is a perfect song to sing and dance to this spring. Play this song and your kids will soon be hopping around, laughing, and pretending they have ears. I downloaded this song a few minutes ago and my 3-year-old wanted me to play it over and over again. Visit this Charity & the JAMband link to download this song for free. Charity provides a free song download each month. I have a folder created on my computer for each song that she releases. You can also go to the JAMband site to listen live and take a look at their cds. My favorite song is still "Peanut Butter and Jam". Go have a listen and let me know what you think.